The zebrafish (Danio rerio) has emerged as a significant animal model not only for studying the mechanisms of muscular dystrophy disease but also for investigating drug therapies for muscular dystrophies. 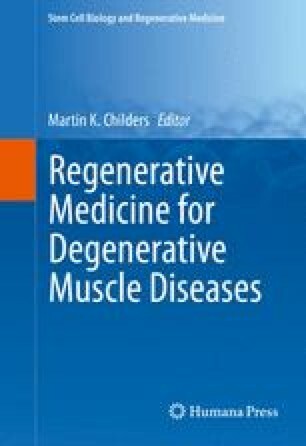 In this chapter, we review recent progress in the use of zebrafish to identify potential drug therapies for two particularly severe forms of muscular dystrophy: Duchenne muscular dystrophy (DMD) and Ullrich congenital muscular dystrophy (UCMD). One common finding across three large-scale chemical screens using the zebrafish dmd model is the identification of phosphodiesterase (PDE) inhibitors as beneficial for the dmd skeletal muscle phenotype. Together with investigations in mouse models and human patients, these studies appear to provide very strong support for PDE inhibitors as possible DMD therapies. We discuss how the zebrafish system has great potential to serve as a preclinical translation model for evaluating optimal drug therapies for DMD and other muscle diseases. Funding for work on zebrafish skeletal muscle disease in the Maves lab comes from the Seattle Children’s Research Institute Myocardial Regeneration Initiative and NIH R03 AR065760. EP was supported by the University of Washington School of Medicine Medical Student Research Training Program.